Light rice cookies with a pinch of cardamom give zest to your afternoon tea or coffee. Dreaming about the fun of making udon noodles and mochi stuffed with adzuki bean paste caused me to impetuously purchase 25 pounds of rice flour during last year’s annual shopping trip… without having first researched how to make these items. Turns out, udon is made with wheat flour and the rice flour used to make mochi is a sweet rice flour. I now had 25 pounds of flour with no inspiration! A “no inspiration item” often transforms itself into an inspiration in our kitchen. We’ve learned that rice flour is a much better thickener in stews and soups than wheat flour or corn starch. We’ve also learned that rice flour makes light and airy cookies. When matched with the exotic flavor of cardamom, you’ve got a trip to India during your afternoon tea! 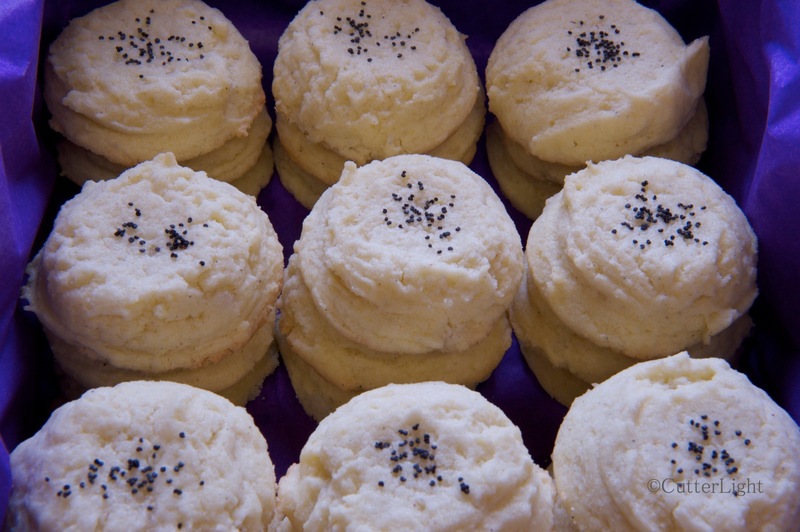 The original recipe was for Persian rice cookies. The recipe came out way too crumbly. I set the dough in the refrigerator and contemplated how to fix it. With the addition of a couple more eggs, the cookie dough was very soft and looked like scoops of vanilla ice cream while it waited to be baked. Our initial test for the cookie is dough flavor… yum. Again, it was very light with a punch from the cardamom. After they were baked and fully cooled, they were as delightful. Combine granulated sugar and water in small pot over medium heat. Bring mixture to a boil, stirring well to dissolve sugar. Reduce heat and summer for 7 – 10 minutes. Mixture should thicken and reduce to about one cup. Remove from heat. Stir in orange extract and set aside. In a medium bowl, stir together rice flour and cardamom. Set aside. In a bowl of a stand mixer, whisk eggs with superfine sugar until smooth. Add butter and oil to eggs and beat until fluffy. Add flour to butter mixture, mix until incorporated. Gradually add in one cup of the sugar syrup and beat well with mixer. Place the dough in a container, cover with a plastic wrap and refrigerate for about six hours. Pre-heat the oven to 350 degrees F and line two baking sheets with parchment paper. Use a cookie scoop to drop out rounds of dough onto baking sheets. Flatten drops slightly with the back of the cookie scoop. Sprinkle poppy seeds on top of each cookie. Bake for 12-15 minutes. Bottoms of cookies will be lightly browned. Remove from the oven and gently place on the cooling racks. I think I have to try those! Yum – I love cardamon. These look scrummy! These look light and delish!